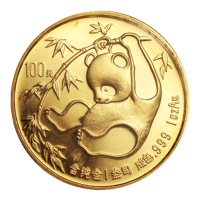 Buy this very early 1985 1 oz Chinese Panda gold coin, 999 pure and from the third year of issue. We ship worldwide! The reverse design depicts a panda bear pulling or swinging from a bamboo branch, and the coin's face value of 100 yuan. The obverse features the Hall of Prayer for Good Harvests (The Temple of Heaven), the title of the People's Republic of China in Chinese characters, and the year 1985. DO NOT USE - GENERAL PURPOSE Buy this very early 1985 1 oz Chinese Panda gold coin, 999 pure and from the third year of issue. We ship worldwide! The reverse design depicts a panda bear pulling or swinging from a bamboo branch, and the coin's face value of 100 yuan. The Chinese Panda coin is one of the only government issued bullion coins to change the reverse design every year. The obverse features the Hall of Prayer for Good Harvests (The Temple of Heaven), the title of the People's Republic of China in Chinese characters, and the year 1985. This coin is legal tender of the People's Republic of China. This beautiful release continues a more than thirty-year old tradition which began in 1983.